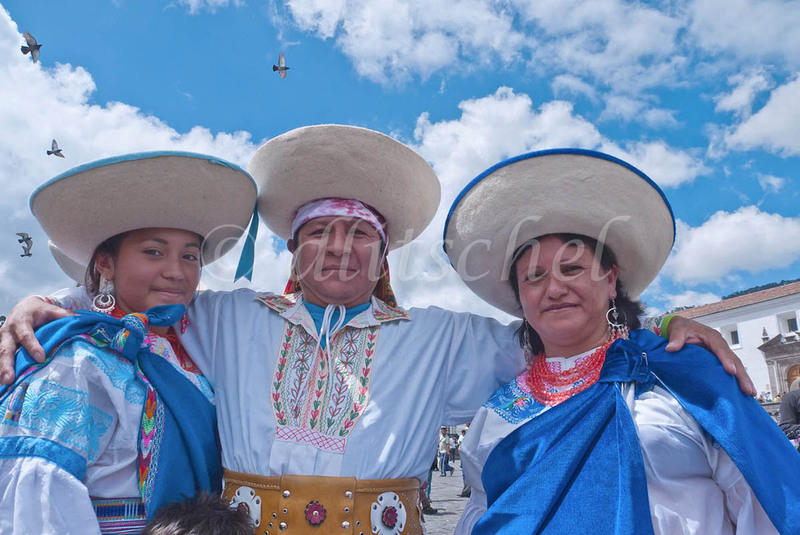 Three dancers from a folklorico group in Quito: Ecuador: Travel photography from around the world, including Cuba, Ecuador, Egypt, Germany, Greece, Guatemala, India, Italy, Japan, Mexico, Morroco, Paraguay, Siberia, Taiwan, Tanzania, and the United States. Three Hispanic dancers, two women and a man, from a folklorico group in Quito, Ecuador pose after performing a traditional dance in the San Francisco Plaza. All three are wearing sombreros and customary clothing.